We are a commercial boat operator licensed by Parks Canada to offer a water taxi shuttle service within the Gulf Islands National Park Reserve. Our vessels are well suited for small groups visiting some of the Park's islands for a brief sunset picnic, a half-day hike or a weekend camp out. Our standard rate is $225/hour with special fares for Portland & Russell Islands. We are able to provide water taxi service to other private islands to those owners as well. Please feel free to contact us to inquire. Portland Island, once known as Princess Margaret Marine Provincial Park, is a semi-wilderness gem of the Gulf Islands National Park Reserve. It's a favourite destination for anchored boaters, day hikers and overnight campers. You can charter one of our 12-passenger vessels, and make one round trip for groups of up to 12 people, or two round trips departing 45 minutes apart for groups up to 24 people. Departure is most convenient from the Canoe Cove Marina E Dock, located near the BC Ferry Terminal at Swartz Bay. Alternatively, for parties arriving by ferry from the Mainland, it's an easy walk to the government dock at Swartz Bay -- and you can save the hassle and cost of bringing your car. The scenic, one-way trip to the island takes about 20 minutes. Drop-off and pick-up is either at the dingy dock in Princess Cove, or right on the beach at Shell Beach camping and picnic area. Typically, a hiking group on a day trip may wish to depart the marina at 10am, spend 4 hours walking the trails & eating lunch, then return at 2pm. Parking is free at the marina, with a ticket displayed on vehicle's dash. You must bring a cell phone for contingencies. Dogs must be on a leash. Drinking water and warm clothing are recommended -- and all your garbage must be carried out. We encourage you to become familiar with the goals and features of the National Park Reserve, as well as your responsibilities and privileges as a visitor. Click here to go to the website http://www.parkscanada.gc.ca/gulf. The Visitor Guide is particularly helpful. Most people who come to this beautiful island for camping, hiking and picnics take a scheduled Sidney Spit ferry. This passenger ferry departs from the Sidney Wharf from June through early September. Our service is ONLY offered outside the operational season/times of the Sidney Spit ferry. We offer unique tours for those desiring an exclusive experience of a romantic walk, sunset picnic and wildlife viewing on a 'Mediterranean-like' sandy beach. Your skipper guide first takes you for a 45-minute waterfront cruise before arriving at the Spit. Then, you step right onto the secluded beach for a one-hour visit. The return trip takes about 15-minutes. Departures are from the Sidney Wharf at the foot of Beacon Avenue, or from Canoe Cove Marina near Swartz Bay. The Spit is also part of the Gulf Islands National Park Reserve. 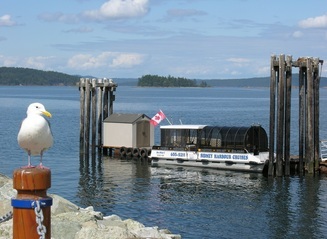 For more information about Sidney island, check out the website http://www.parkscanada.gc.ca/gulf. The cost of the guided tour, round-trip transport and beach stop is $425.00 for up to 12 people. This service is ONLY offered outside the operational season/times of the Sidney Spit ferry.